On Wednesday, October 15, 2014, the Centre for Evidence Based Library and Information Practice at the University Library, University of Saskatchewan, held its very first Fall Symposium with the theme of Librarians as Researchers. Wow, I say! 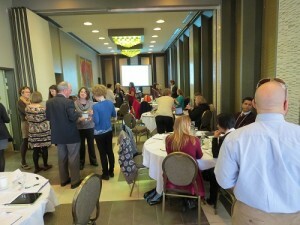 The speakers were inspiring, the food was excellent, the door prizes were fun, and the atmosphere was convivial. Let me give you quick synopsis of the day. Registration opened at 8am with Carisa and Crystal checking everyone in and making sure everyone had what they needed, including an entry form for the door prize draws. At 8:45, I welcomed participants to the longest room ever (the Marquis Private Dining Room on the U of S Campus is a long rectangular space that turned out to work well for our group with plenty of room for the food and coffee table at the back). I was pleased to be able to introduce the Fall Symposium’s keynote speaker, Margy MacMillan from Mount Royal University, who spoke about the interactions between the what and the why of research. You can check out the keynote abstract and Margy’s bio right here. Margy’s talk involved some interactive work as we thought about and shared our first research questions as well as our most memorable research questions. The day’s single-track session stream was a good format for this one-day symposium. Presenters had 20 minutes to speak and entertain questions. Session topics were broad and interesting, and the full range of abstracts can be found here. A feature of the symposium was ample time for connecting and networking. The morning break, lunch, afternoon break, and post-symposium social offered a chance for participants to talk and share amidst a plethora of food. My motto is: better too much than not enough. Although from my perspective, the food seemed just right! Ask any attendee about the granola bars. After the sessions were finished and the door prizes were awarded (door prizes donated by the U of S Campus Computer Store, U of S Bookstore, University Library, and McNally Robinson Booksellers) symposium-goers retired to the University Club for a restorative beverage and even more food. It was an excellent wind-down to a wonderful day. Our 54 symposium attendees from BC, Alberta, Saskatchewan, Manitoba, Ontario, Quebec, and the US. It was wonderful to meet and see you all! Keynote Margy MacMillan and all of our session presenters: fabulous job! Let’s do it again next year, okay?